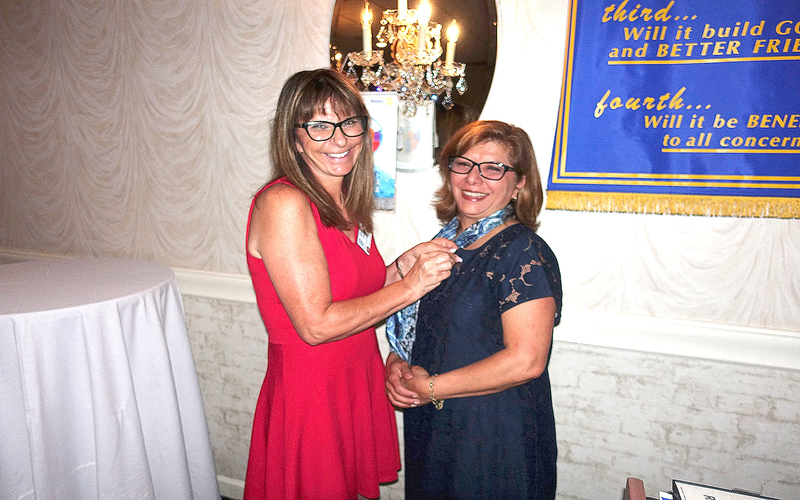 Vineland Rotary Member Sandy Forosisky (left) puts a Rotary pin on returning Rotarian Maryam Nassiri at the Ramada of Vineland, where the club meets for lunch every Tuesday at 12:10 p.m. PHOTO BY JAY PARKS. Vineland, NJ – The Rotary Club of Vineland continues to add active and civically engaged members to its rolls. At a recent membership luncheon, held at the Ramada of Vineland, returning member Maryam Nassiri was installed. With approximately 80 members, the Vineland Club is the second largest in Rotary District 7505, which encompasses central and southern New Jersey. Former club president Ed Duffy conducted the induction ceremony for the returning member. Nassiri was sponsored by Rotarian Sandy Forosisky. Nassiri is an agent with Berkshire Hathaway Fox & Roach Realtors in Vineland and she was a Vineland Rotarian for many years before her relocation to Arizona. Before Nassiri’s temporary move, while her son and daughter were at Vineland High School, each served in turn as president of the Rotary-sponsored Interact Club while their mother was the club’s volunteer coordinator. Interact is a service club for young people ages 12-18, which gives them an opportunity to participate in fun, meaningful service projects while developing leadership skills. Nassiri was also a Vineland Downtown Improvement District board member for five years and worked tirelessly in downtown beautification projects. The Vineland organization meets on Tuesdays at 12:10 p.m. at the Ramada. For more information, visit www.vinelandrotary.com or email the club at info@vinelandrotary.com. Posted August 4, 2018 & filed under Rotary News.